What key is that 3.5 in? C or C#? Everybody should be advised. This is what can happen! I use it to play an octave below 1.8 in D. But I can get the pitch to vary depending on how I play it. There are people in Japan much worse than me. I know a guy with over 2000. He is demented. I would like to pare this collection down, it's too many. How many of the Mongo Flutes are Taimu? What's the story on the one's that arent? Are you airing them? Like walking the dog! AMAZING collection, Brian ! ! ! Let's hope it is that and not something more lascivious in nature. 2000 shakuhachi! That's hard to fathom. What does the guy do for a living? I guess if he sold shakuhachi we'd know about him. His story must be curious one. 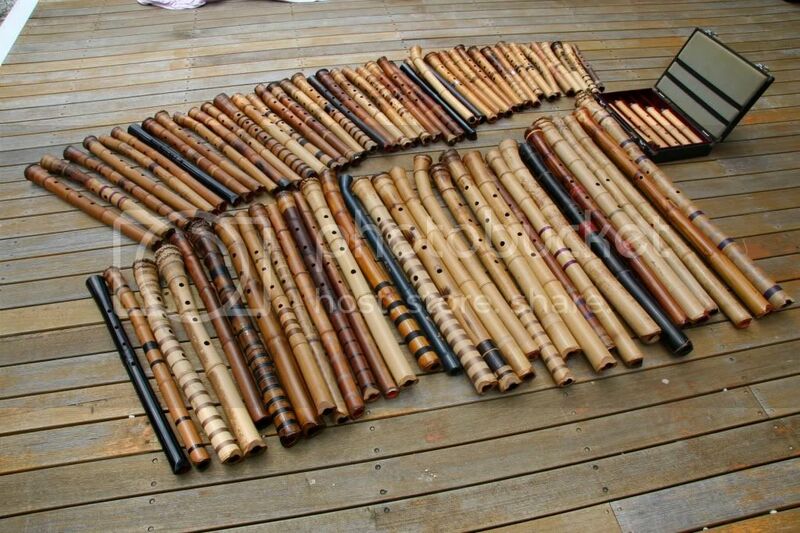 If it's a gaggle of geese, a pod of whales, and a murder of crows, is this a forest of shakuhachi? a row (ro) of shakuhachi? His work? A total shakuhachi nerd! Nobody knows where the money comes from - apart from his wife is working. He doesn't sell much - only to a few people. He has the most amazing amount of research where he has measured every single shakuhachi that has gone through his hands in detail (and that is thousands).... all written in notebooks. Imagine if there is a fire! Kosugi, the chair person of the Komusō Research Group has tried to persuade him to make his research open to others. But he doesn't really want to. The fact is that a lot of amazing amateur researchers have added a lot of important information to our knowledge about this instrument. I really hope he will share his. His story IS curious. 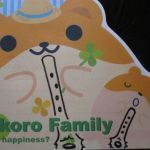 He told me in order to really make your life a REAL shakuhachi life - you have to think about only shakuhachi and so much that you forget your partner's face. I told him I was an amateur! I know Iwamoto has expressed similar thoughts. We are talking about the same guy, aren't we Brian? A total shakuhachi nerd! ....... He has the most amazing amount of research where he has measured every single shakuhachi that has gone through his hands in detail (and that is thousands).... all written in notebooks. Sounds like this man may have some of the characteristics of a high functioning autistic person. Yeah. That's not his home, it's his dojo. I've never been to his home. However this degree of obsession is a cautionary tale as Iwamoto exemplifies. The guy we're talking about.......among other things, he committed to shakuhachi after being a radical student activist in the '60's. He was involved in violent stuff and one of the cops took him aside and said, "This is not going to end well for you. You like shakuhachi, pull yourself together and focus on that instead of this revolt." We all come to shakuhachi from different angles. Okay, now it's time for one-by-one full length photos with size and maker. ... Oh yeah and don't forget the SUPER-Ya-Know-This-Is-A-Recession-Now-Don'tcha discount prices. Tairaku, is there a favorite Shakuhachi? If so, why do you like it characteristically above other flutes? He told me in order to really make your life a REAL shakuhachi life - you have to think about only shakuhachi and so much that you forget your partner's face. A self-respecting partner’s permanent exit from such a relationship would presumably expedite the shakumaniac’s amnesia. There are few personality traits I respect more than all-out obsession.